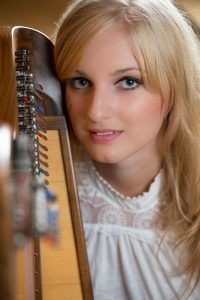 Ewelina Brzozowska is a Polish harpist based in Glasgow. She regularly performs at weddings, receptions, and major function venues across Scotland. Having graduated from the Royal Conservatoire of Scotland with a BMus with Honours in 2014, she has continued her commitment to study and work in Scotland She undertook an apprenticeship with the Scottish Opera during which she participated in two major projects – the production of Britten’s Midsummer Night’s Dream and The Wagner and Verdi Gala in Glasgow City Halls. She performed in Young Artist-in-Residence Maciej Granat’s project ‘Germaine Tailleferre Anniversary Concert’ presenting Tailleferre’s Concertino for Harp and Orchestra. Ewelina is a dedicated orchestral and chamber musician. Her performances include the Hogmanay Gala Concert at the Glasgow Royal Concert Hall, solo performance for the Ryder Cup in SECC and a collaboration project between Nicola Benedetti and the RCS session orchestra to name a few. Ewelina has also been invited to perform with various orchestras and choirs in the UK including the Scottish Festival Orchestra, the Scottish Bach Players, Glasgow Chamber Orchestra, Edinburgh University Orchestra, Strathclyde University Orchestra, Amicus Orchestra, Cumbria Rural Choirs in Penrith and the Cowal Choral Club in Dunoon. As a chamber musician, she has built a broad experience playing in small ensembles, duos, trios, and a harp quartet. Ewelina regularly performs as part of her flute and harp duo, Duo Dalriada, with Alasdair Garrett on flute. Ewelina has performed at the Gleneagles Hotel, the Dumfries House, the Balmoral Hotel, Trump Turnburry, One Devonshire Gardens, Hilton Glasgow, the Blythswood Square Hotel, The Caves, The Malmaison, The Crowne Plaza.Having graduated from the Royal Conservatoire of Scotland with a BMus with Honours in 2014, she has continued her commitment to study and work in Scotland. She is a former harp tutor for the St. Aloysius’ College and she currently works as the harp and clarsach instructor for Glasgow City Council.